BATMAN '66: The Riddler's Ruse (Part 3 | Conclusion). BATMAN '66: The Riddler's Ruse (Part 1). My good friend Eric is starting to expand his reviews of comics and this is a great way to start. I love Batman and I can’t wait to read this series. Well what can I say about the weekend that just passed us by? Andy Murray won his first Wimbledon Championship, we had some of the hottest temperatures in years and I was lucky enough to go to the London Film and Comic Con in Earls Court. I have to start that I am only able to write about the first couple of days of the convention since I am currently suffering from a sore throat. As a result by Saturday evening I was feeling so bad that travelling into London on Sunday would have seemed like travelling to the North Pole. A shame really since I missed the DS9 talk, catching up with the “Podfather” from Trek Mate (Mr. Wayne Emery) and my good friends Bunny, Laura and Jon. At this point I want to thank Jill from Media Ten & to Show Masters for arranging press passes for Trek Mate. As Trek Mate expands we want to cover more of these events and your support of our network is really appreciated. The event this year was focused on “Game of Thrones “and “Deep Space Nine”. There were quite a few guests from Star Wars, some from Doctor Who and many other franchisees. Friday evening the event began at 6pm. There were going to be some signings, photo shoots and of course all the wonderful merchandise vendors, comic stalls and more. For the Friday evening I was taking my nephew Jon and his girlfriend Theresa. Both enjoy science fiction, film etc but not perhaps on the scale that I do. While we were travelling up on the Tube I reminded the guys with a disclaimer that I had not been to any of these events so if they didn’t like it then don’t look at me. I had nothing to worry about….. I had only been to Earls Court a couple of times over the year. Once was for the Doctor Who experience a few years ago and the Ideal Home Exhibition. We were actually in the second arena which was close by but the first thing we saw when we arrived was how long the queues were. If this was Friday imagine what Saturday and Sunday were going to be. I think this took Jon and Theresa by surprise. The amount of people actually attending, those actually in costume and the overall excitement you could feel from the crowd. 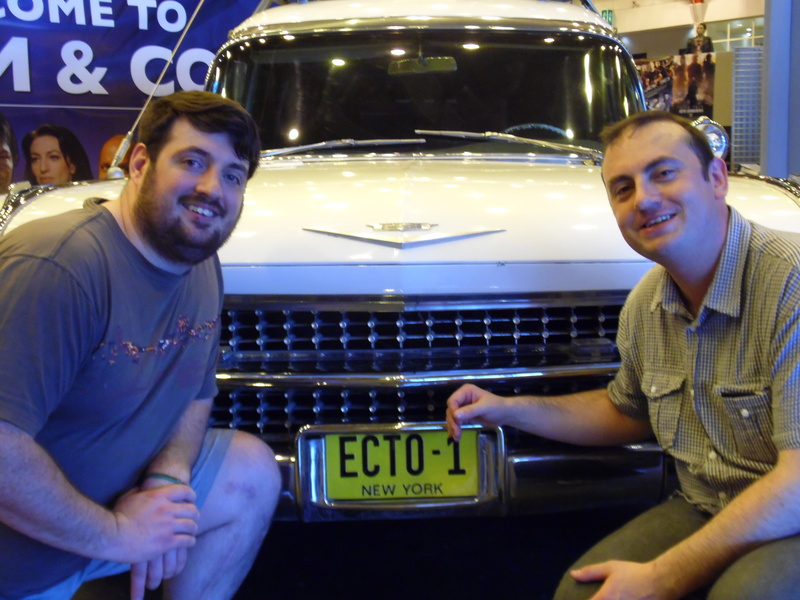 Once in we went straight to ECTO-1. The car from Ghostbusters was on display at the front entrance of the arena. It looked fab! Now, nothing beats the Batmobile but this was a close second. After a couple of pictures and imagining we had proton packs we decided to start our wander. The first thing that stood out for me when the doors opened was that how many people had decided to leave getting tickets until the day itself. Considering the event was only on for a few hours on the Friday ordering online makes even more sense to me now. I have to say the size of the venue was impressive; it will be hard to fill this I thought. How wrong was I! We started walking along all the merchandise stalls and while I had seen some of these at Collectormania this was on an all together different scale. Jon and Theresa were captivated by what you could actually buy. Everything from actions figures (I call mine collectibles), signed autographs, photos to get autographs, wallets, canvass, outfits, dolls and so much more. As always I was keeping my eye out for Star Trek merchandise but there were some great Batman products out there too. I left Jon and Theresa just after six to go and have my only picture of the weekend. This was With Andrew Robinson who played Mr. Garak from Deep Space Nine. I was the first person to have my picture taken which was very nice. He introduced himself to me (how great was that! ), thanked me for coming and then we had the photo. I mumbled something about how great it was to meet him, thanking him for his time etc. I really enjoyed having my picture taken with Andrew. After catching up with Jon & Theresa we headed towards the comic “zone”. These were spread out but we had entered the part where the likes of Neal Adams were based. More about Neal Adams later but I have to say I was “geeked” out seeing Neil. He drew Batman!!!! We continued to walk around the area when we saw out first guest. It was William B. Davies, “The Smoking Man “from the X-Files, then we saw Nana Visitor from DS9 (simply stunning) and then I was running around like I had just been given my own Tardis when I saw Amanda Tapping. Did it get any better? Not really because on Saturday I would get to see Eve Myles and that was simply wonderful…. While walking around the various stalls we came across “Geeky Comics”. We were introduced to a new comic coming out in August that involves Jack the Ripper, Vampires and more. The person who was explaining the story to us spoke with such passion that we couldn’t have been more captivated by the story. I know Jon likes to read comics but Theresa is not that keen but even Theresa wants to start collecting the series. Having always followed main stream comics I have not really ventured far into the world of independents but after this I intend to look further afield when it comes to what I read. While wandering around we came across some wonderful costumes. One included Bane who looked just as menacing as Tom Hardy from “The Dark Knight Rises”. Theresa was insistent we follow him to grab a picture and would have been even better if I had used the flash (only I would forget t to use the flash) but if you like orange I think it looks rather good. Jon came across some Judge Dreads and this was a very funny picture of him kneeling in front of them. I really love the fact they everyone who is in a costume is happy to pose for pictures, interact with you to help create a fun picture. 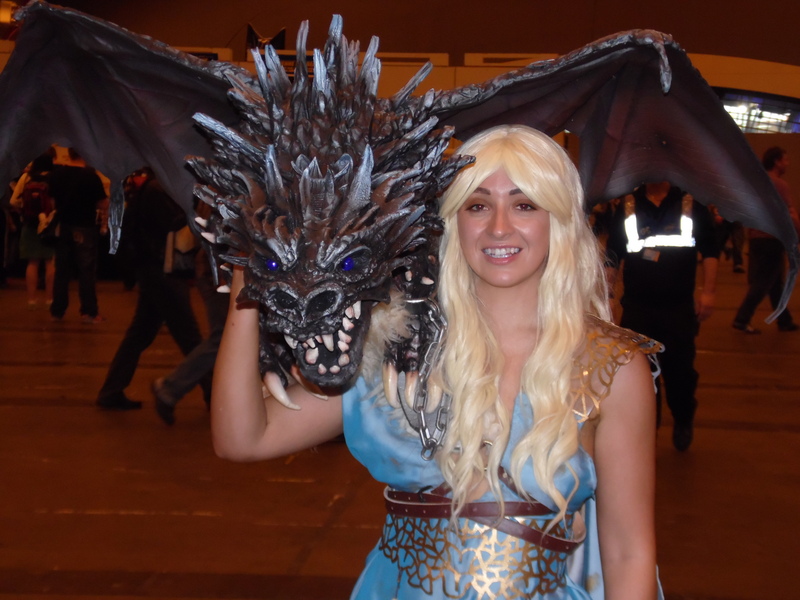 One of the stand out costumes for me on the Friday was someone dressed as Khaleesi from “Game of Thrones” with a wonderful Dragon prop that rested on her shoulder. This was also popular on Saturday with those wanting to take pictures of those in Cosplay. On the way home Friday we all felt that it was a good evening. I am glad I went on the Friday since it was not as busy as the Saturday turned out to be. This gave us a chance to walk around, see where everything was and get a feel for the event. Jon & Theresa really enjoyed themselves and actually want to go to the winter event in October. I always knew they had an “inner geek” inside them and like me over a year ago didn’t know where to go or that these events regularly took place. For me personally it was really nice to be able to share some of my interests with them. They laughed at the excitement I had going around event, what it meant to be around like minded people. Saturday started a little later for me. I wanted to attend the Star Wars and Doctor Who talk but my throat had been playing up over night. Sleep was elusive and I just couldn’t get up. Eventually I found myself back at Earls Court just before 11am. Soon enough I met up with Jon Taylor the News Editor from Trek Mate News. I had last seen Jon in Milton Keynes so it was nice to catch up, discuss Trek Mate and the event. Jon had a busy couple of days planned with various photo shoots and talks. The first thing that struck me was how busy it was. After my comments about how it would be hard to fill this place up I was eating some humble pie. The arena / hall were packed from top to bottom. Another reason why I was so glad to have gone on the Friday. 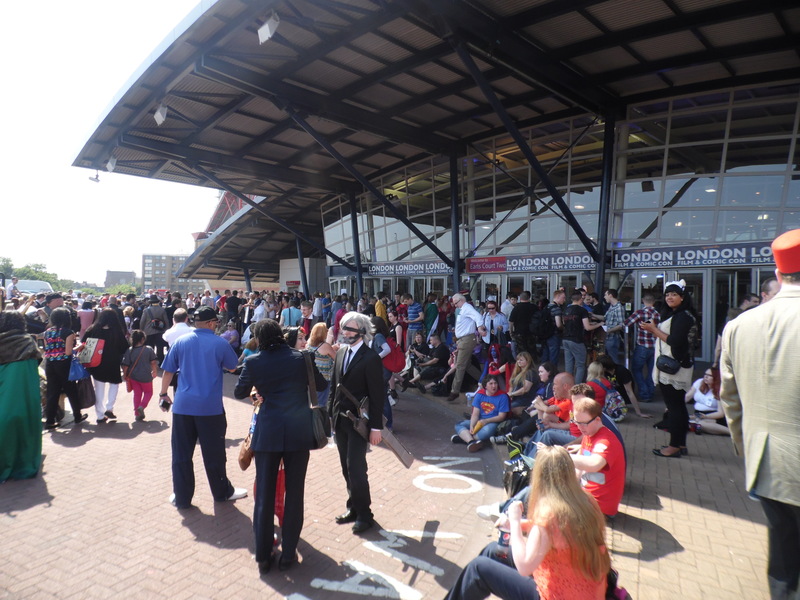 Again many had left buying tickets to the day; again I can only say that buying on line would have avoided queuing. Saturday for me was about wandering the arena / hall again. I visited some of the stands that took my interest the day before including “Geeky Comics”. I also had a look at the autograph stands and this is where I was “swooning” over Eve Myles from “Torchwood”. I do hope Eve comes along to the winter event. I went to a comic talk with Neil Adams. Neil Adams is a comic book artist and was well known for drawing Batman in the 70’s & 80’s along with Denny O’Neil during what some consider being a “golden age” for the Bat. Neil spoke about how he started drawing comics, how the industry was going through a very difficult time when he started (Congress was trying to wreck the industry) and also why he decided to take a break from drawing comics. Neil also spoke about some of his concerns with comics today, which they rely too heavily on smashing up cities, grander scales that leave little room for character development. I totally agreed with what Neil was saying. For some time I have felt that the stories have moved away from the character stories of things like “Hush” etc. I really enjoyed this talk. I also managed to take a few more pictures including some of Darth Vader, a great looking Battlestar Galactica uniform, a brilliant Robin costume and of course some Star Trek outfits. 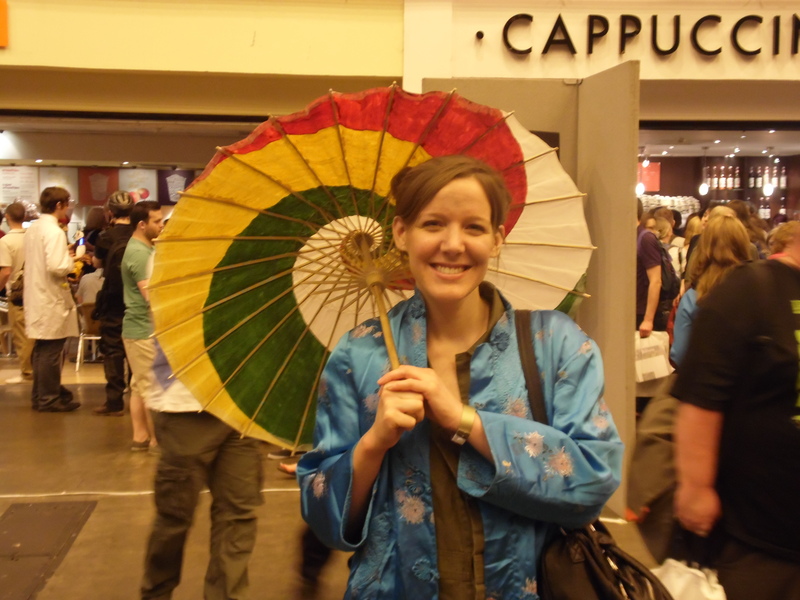 I also saw a costume from “Firefly” with a woman dressed as Kaylee. Again the amount of effort that everyone had put into their outfits / costumes was amazing. One day I will have to muster up the courage and wear a costume. I am almost tempted to go in a BSG uniform, they really do look good. By late afternoon the effects of my throat were really getting to me. I can cope with pretty much anything but a sore throat… After having a pint with Jon I decided it was time to go home. I was upset by this since I wanted to catch up with Bunny who I had only seen for a few minutes the day before and I would miss Laura on the Sunday. For me even though I did not do as much as I had wanted, missed the DS9 talk I really did enjoy the couple of days I attended. I would definitely go again; the event looked well managed, there were enough things for everyone to do. A great guest list with some wonderful fans attending. 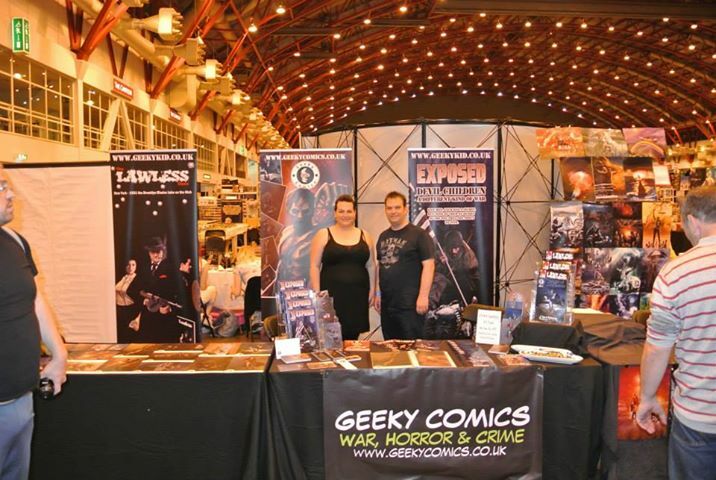 I am already counting down the days till October…..
For Geeky Comics go to their Facebook page. Thanks to Bunny & Sina for their help with the feature.